The Nigerian troops have killed 58 bandits in Zamfara state and lost two soldiers in the operation, tagged, ``Saharan Daji’’. 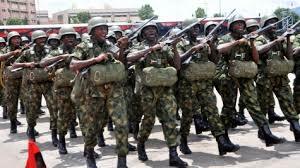 The operation took place at Dumburum and Gando forests of the state, the operation’s Acting Force Information Officer, Major Clement Abiade, said in Sokoto on Wednesday. He said the bandits were killed on 20 January, 2019 at Dumburum and Gando forests when the troops encountered them in a large gang armed with sophisticated firearms and rocket propelled grenades (RPGs). He said during the encounter the bandits were forced to abandon their camps due to superior firepower in a fierce gun battle that lasted several hours. According to him, items recovered from the bandits include five Fabric National Rifles, four AK Rifles, 10 locally made rifles, one locally fabricated pistol and 40 motor cycles. “The casualty figures on the bandits’ side were 58 bandits neutralized, while one was captured alive. Troops also destroyed 18 camps and rescued 75 kidnapped victims held in some of these camps. The freed captives, who were mostly from local communities in Zamfara State, were debriefed and reunited with their families. “Unfortunately, Operation SHARAN DAJI also suffered some casualties in these encounters. So far, two gallant soldiers and two members of the vigilante paid the supreme prize. A total of eight soldiers and six vigilantes also sustained various degrees of gunshot injuries. Abiade said that those who sustained injuries were immediately evacuated to Federal Medical Centre, Gusau for medical treatment, while those with life threatening conditions were evacuated by air for “specialist attention” outside the theatre of operation. “The families of the fallen heroes have been contacted accordingly, while the deceased members of the vigilante were laid to rest in Anka Cemetery according to Islamic rites,” he said. The spokesman said the Force Commander of the Operation, Major General S.O. Olabanji, had condoled with families of the fallen heroes and assured them that their sacrifices would not be in vain. He also reaffirmed the commitment of the operation to rid Zamfara State of all forms of banditry and criminality in line with its mandate. Abiade further said the current offensive was designed to identify and destroy bandits’ camps/enclaves in the area of operation. He added that the operation was being conducted simultaneously in collaboration with all security agencies and local vigilante to achieve synergy and urged the public to cooperate with the troops and furnish security agencies with useful and timely information about bandits’ activities within their domain.